Go the extra step and partially bake the crust before filling it for extra crispiness. Being a part-time Parisian allows me a full-time love affair with quiche. Even my friends who don’t bake much make quiche. It’s easy for the French: They buy all-butter already-rolled-out crusts at the corner convenience store, getting them halfway to quichedom in no time. Whatever. I’m on a crusade to bring it back. It’s all part of my mission to make the world tastier. The most famous quiche of all is the Lorraine, made with custard, cheese and lardons (pork fat or bacon). But this is a dish that even the most tradition-bound French person will give you license to tinker with. The basics are a crust and a custard made of cream of eggs – and whatever you’ve got tucked away in the refrigerator. After that, you are on your own; because you don’t need much of any one ingredient, a quiche is a perfect catch-all. 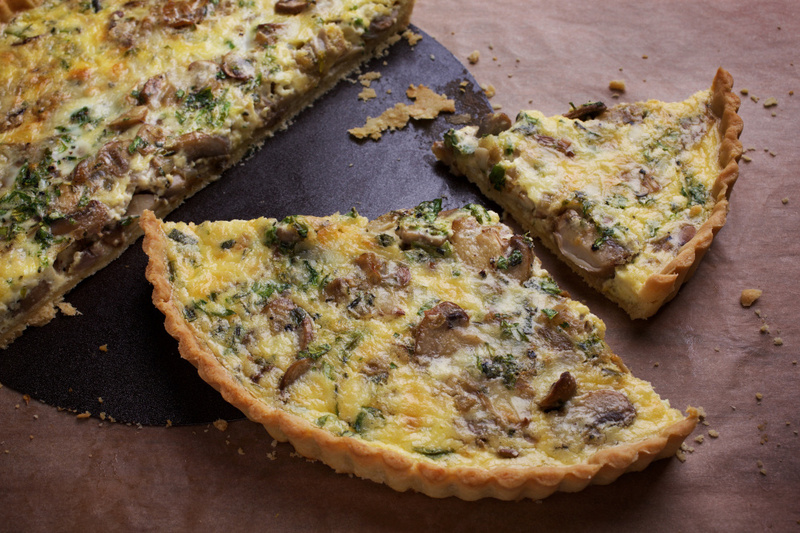 My quiche gets its good flavor from mushrooms and its good looks from cheese and herbs. But as much as I love it, I know how fickle I am when it comes to quiche. As soon as the weather changes and there are asparagus or peas or ramps in the market, it’ll be au revoir ‘shrooms and hello, spring vegetables. That’s one of the joys of having quiche in your repertoire. • There are two classic pans for a quiche: one metal, with fluted sides and a removable base (it’s the one I use); and one porcelain, with fluted sides and a solid base. If all you’ve got is an all-American pie plate, that’s OK. It would be a shame to miss out on this quiche for lack of gear. • My go-to crust for a quiche is my version of a classic pâte brisée. I add a tad of sugar to the mix – for flavor and color – and so it’s a great switch-hitter. You can use the crust with both savory and sweet fillings. And yes, you can be all-French and buy a ready-made crust. • Go the extra baby step and partially bake the crust before filling it; the quiche’s crust will stay crisper longer when you do. • If you use a mix of mushrooms, your quiche will be more interesting; if you toss in some more unusual or exotic varieties, it just might be fascinating. • When you’re mushroomed out, swap the mushrooms for leeks; think about celery, peppers and onions; try eggplant or zucchini (make sure you cook away all the excess liquid). You can use cubes of cheese instead of grated cheese; add bacon in bits or chunks; and top the quiche with cherry tomatoes, which are so pretty when they pop from the oven’s heat. Use butter to grease your tart pan – even though the pan may be nonstick. Preheat the oven to 400 degrees. Press a piece of lightly buttered aluminum foil against the dough’s surface and fill with dried rice, dried beans or pie weights. Place the tart pan on a baking sheet lined with parchment paper or a silicone liner.